The highly-flexible NexLog Reporting Engine option (a.k.a. 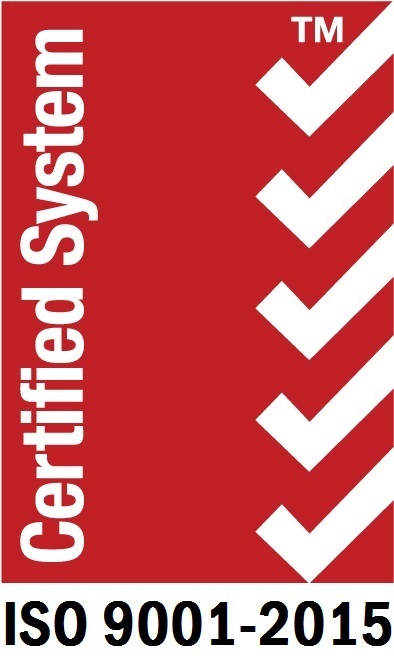 Enhanced Reports) is pre-loaded with standard reports, or you can easily build custom reports. Reports are delivered automatically to users at designated times, days and intervals. The NexLog Reporting Engine gets actionable information to supervisors and directors when they need it, increasing awareness and potentially changing the outcomes of critical situations. This report is based on LEC identifier data for 9-1-1 calls (provided via CAD-Spill ANI/ALI Integration). This type of report is available in Pie and Bar graphs. 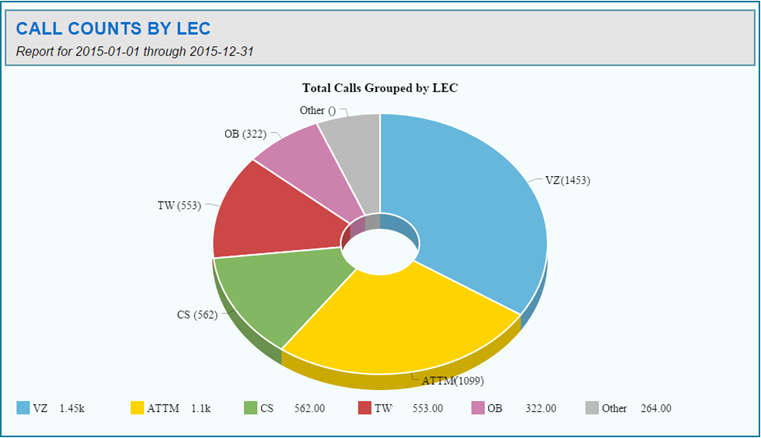 For more detailed analysis of each LEC's 9-1-1 call delivery activity, you can add additional filters such as Class of Service or Confidence Factor. This report is based on the geo-coordinate location data for E9-1-1cellular calls (data provided via CAD-Spill ANI/ALI Integration). For this type of report, you can define the geo-boundaries and select the desired recording criteria. 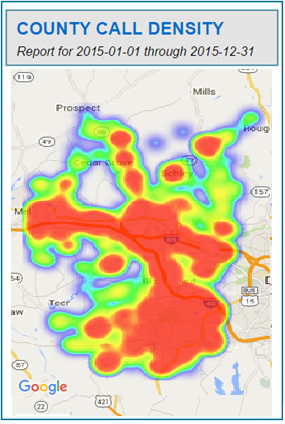 This report allows you to see the latest incidents that have been created. In addition, you can replay each of the incident's audio recordings directly from the report. This report lets you identify the most commonly used words in the Call Notes that have been entered by users. This type of report can also be used to see the commonly used words in captured TDD interactions, SMS-to-911 tty interactions, and NG9-1-1 Text interactions. 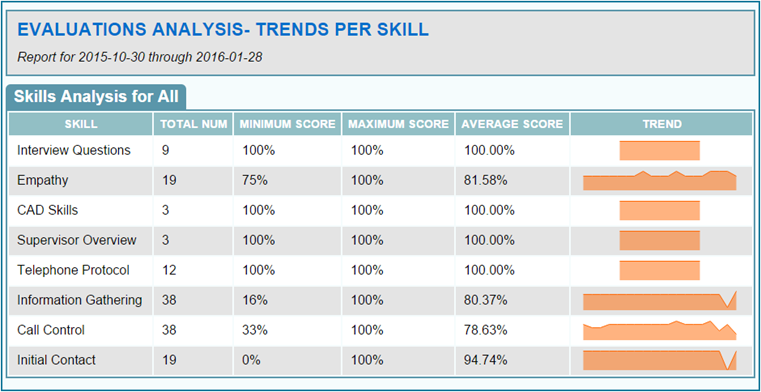 This report lets you quickly see the scoring trends for each Skill-type. You can also compare the results from multiple Evaluation Groups, Shifts, Teams, or Agents. This report lets you view and compare the scoring trends for selected evaluation questions. This report allows you to quickly compare Evaluators' activity for different time periods by viewing how many evaluations were completed. Additional reports are available to see the scores given by Evaluators. This report allows you to track each users' login times and durations. 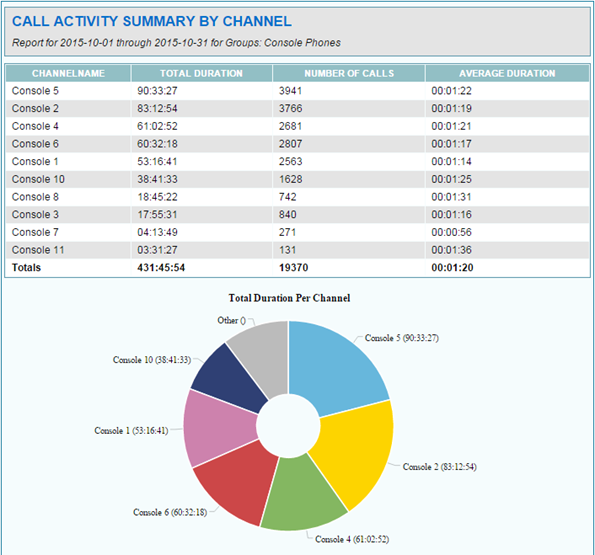 With this report, you can easily see channel statistics for any telephone or radio resource. 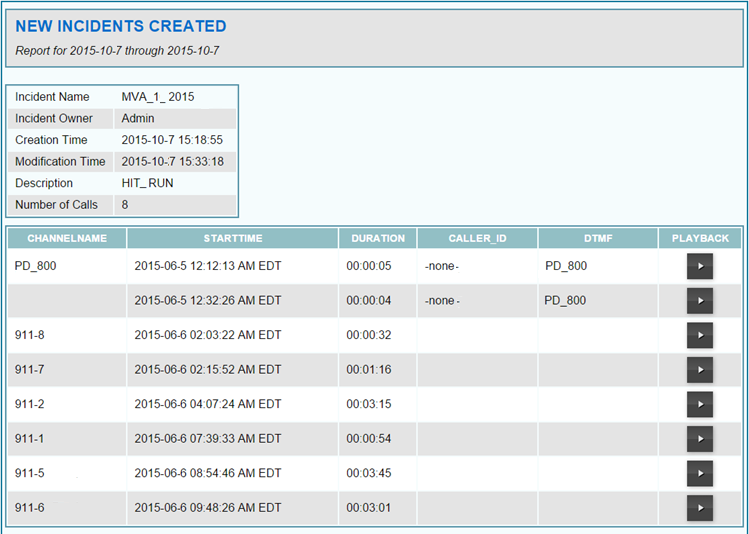 Call Activity reports can also be generated against CallTakers to view their average call resolution time. 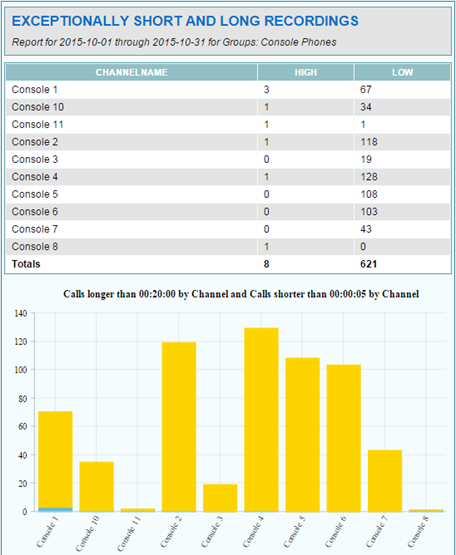 This report allows you to quickly view call counts for extremely long and extremely short calls. Exception reporting can help you determine the number of potentially abandoned calls that were answered at each position, as well as the number of extended-length calls at each position. Call length parameters (both long and short) can be customized in each report.